URGENT! PLEASE HELP PROTECT AND PRESERVE ANCESTRAL GRAVE! 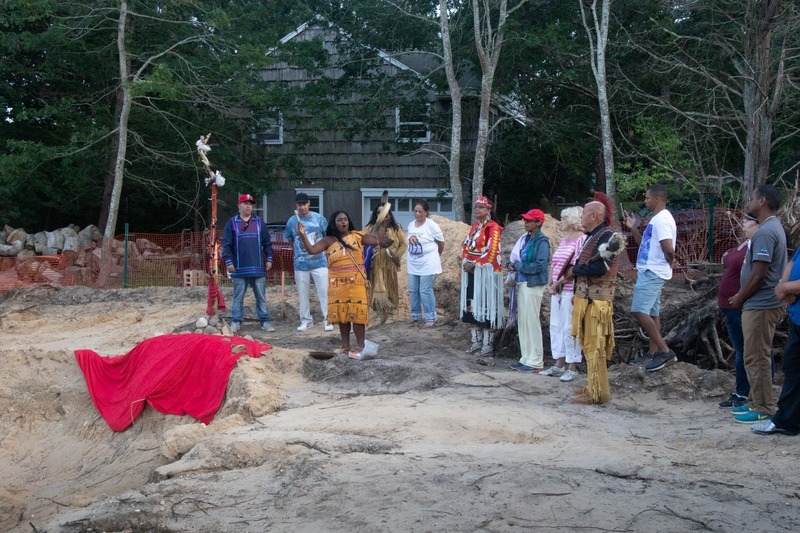 On August 13, 2018, we witnessed firsthand the desecration of a Shinnecock Indian ancestor’s grave, when a skull, bones, and 18th Century glass bottle were unearthed during the construction of a home just five minutes from our reservation. Now, $50,000 must be raised to rebury the remains and preserve the site which is sacred to us. When the remains found, we were helpless to stop the digging and raking of bones initially deemed by local law enforcement to be part of a crime scene. This tore at our souls. We could only offer songs, blessings, and prayers to heal our ancestor and ourselves. Yet, we are thankful that the property owner and construction workers contacted Shinnecock tribe members immediately after finding the skull and 18th Century glass bottle, which signifies that this ancestor was a leader of our people during colonial times. In many other instances, when people have dug their foundations on land that is on Shinnecock Indian aboriginal territory, the ancestral remains found were thrown away, stored in private collections, or put on display in museums. Homes and businesses were then built on these burial sites, so we could never return our ancestors’ remains to their original resting place. There are reports that this is still going on as if we are not even human. The location of the grave is on private land in the Shinnecock Hills where the Shinnecock people were forcibly removed from in 1859. The specific site on 10 Hawthorne Road within the Town of Southampton, New York is only a five-minute drive from the Shinnecock Indian Reservation. Our ancestors rest in the Shinnecock Hills—their graves facing west, so they may enter the spirit world through the sunset with ease and join the Creator. 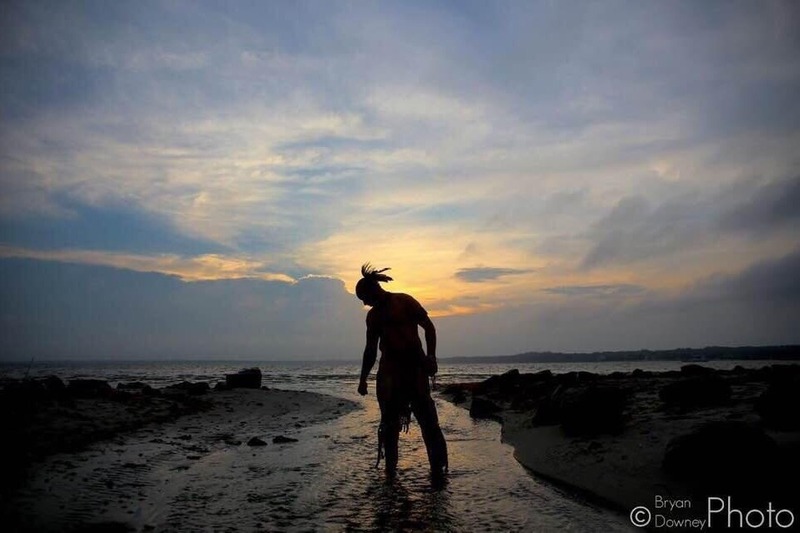 Our elders have always asked us to protect our land and protect our ancestors’ burial sites. In this way, our next generation may know where we come from and that they walk in the footholds of their ancestors who sacrificed everything for our survival. Now, we cannot protect and preserve that which is sacred without your help. 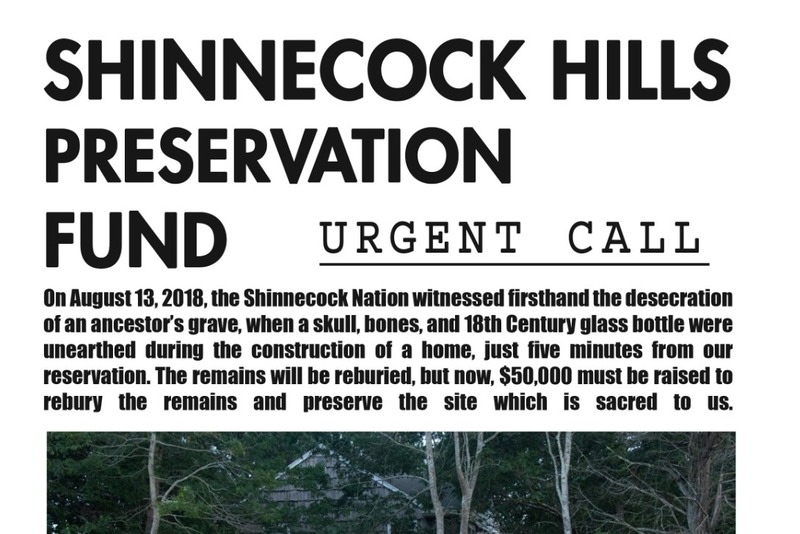 We have confirmed that $50,000 must be raised for the Shinnecock Indian Nation to pay for the reburial of our ancestor’s skull, bones, and glass bottle unearthed on August 13, 2018 as well as site restoration. Originally, the Nation was told we would need to pay $185,000 for various costs to stop construction, rebury our ancestor, and preserve this sensitive area. We are so grateful that the property owner and the Town of Southampton have graciously met with us and in good faith agreed to preserve the property as a historic site and limit the Nation’s contribution to $50,000 for the purpose of site restoration on September 7, 2018, in a meeting with Town Supervisor Jay Schneiderman. Please support the Shinnecock Indian Nation in raising $50,000 as an immediate need to preserve and protect our ancestors’ sacred burial site. If the goal is surpassed, the funds will go toward future preservation and long-term stewardship efforts for ancestral grave protection. 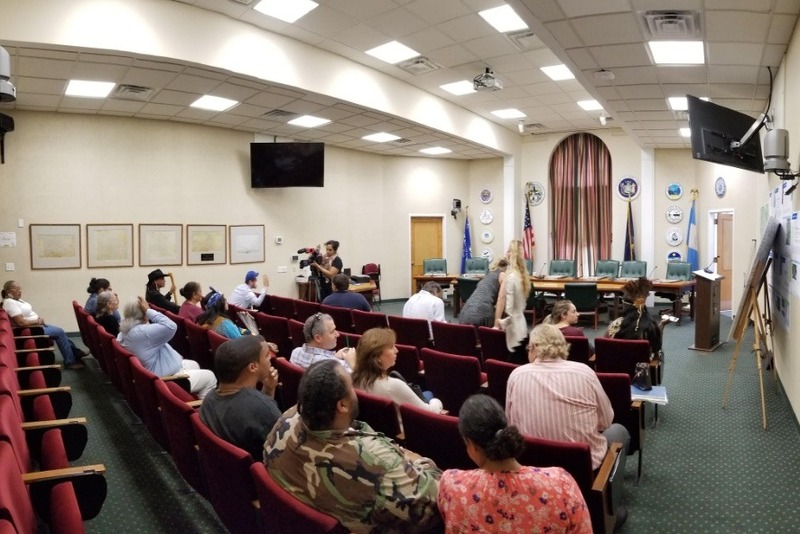 For decades, we have pleaded with the Town of Southampton, Suffolk County, and State of New York to enact legislation and adopt protocols to prevent the desecration of ancestral graves. New York does not presently have clear individual protections in place for graves found on private land unlike the policies of 46 other states. The time is now for us to achieve our elder’s directives. We hope you can join us. Tábūtní (Thank You). The fundraising has received a great contribution! Local photographer and friend of Shinnecock, Bryan Downey, has donated the sale of a great image! We are thankful for Bryan's $500.00 donation, South Fork Natural History Museum for hosting their benefit, and Gregg Lippmann from Parsons Lane, Sagaponack, for purchasing the print! The efforts to complete the campaign continue. Please share the page if you can, Annual Giving Tuesday is tomorrow! Hi all - thank you again for your personal donations. We have reached a great milestone on the GoFundMe: $ 8,000! In anticipation for the busy and eventful Fall season and the annual National Native American Heritage Month, I wanted to extend the reach of this fundraiser to a printed flyer. If possible, please share, print, hang, and distribute these flyers whenever possible - it would be a great help to reach individuals who are able to donate and reach the goal of the campaign! Some ideas for the flyers: community boards, taped/stapled to outdoor locations, front desks of businesses, or handing out to friends. Thanks to everyone who is helping raise funds to preserve and restore the Hawthorne Site! My name is Jeremy Dennis, part of The Shinnecock Graves Protection Team helping organize and maintain this page with updates. I want to clarify that the funds in this campaign will be withdrawn in my name (Jeremy Dennis) on a weekly basis for the eventual financial delivery to the Shinnecock Tribe to repay a $50,000 loan used to fill in the development hole, replant grass and trees, and try to re-create a sense of the original preserved plot of land. As the goal of this campaign is met and funds are raised, payments will be delivered via money-transfer or check. Thank you and the effort continues!